With pressure on costs, increased fuel prices, the water shortage in Cape Town in 2018, and an economy that is struggling at best, the remedial construction industry can prepare for much of the same challenges in 2019. The industry is a major supplier of employment and a decline in industry trends puts pressure on contractors to maintain their workforce sizes. This forces companies to focus on production efficiencies and to streamline internal processes to maximise productivity. This is not necessarily a bad thing as productivity is one of the most important success factors in the construction industry. Contractors able to control their costs, maximise the output from their workforce, focus on efficiency of delivery and keep sales ticking over will succeed in 2019. In the building refurbishment sector of the industry, contractors with proven track records will still be able to attract orders. This is especially the case when it comes to asbestos removal. With legislation pending, a bill is in its final draft phase that will strictly govern which contractors will be allowed to handle asbestos. Those contractors with the right skills, and the necessary clearance from government to handle, remove and dispose of this dangerous substance should be in a positive position in the next 24 months as companies begin to pay attention to deteriorating asbestos on their buildings. The bill does provide for a small amount of asbestos that can be handled by contractors not approved as asbestos compliant contractors. Type one asbestos work does not require registered asbestos contractors when painting asbestos products excludes surface preparation or cause the release of asbestos fibres, if the removal is less than 10m2 of asbestos products, gutters, piping or asbestos insulation. Type two asbestos work requires registration as a type two asbestos contractor when repairing or encapsulating asbestos in a manner that does not require surface preparation and the removal of asbestos. Type three asbestos work requires contractors to be registered as a type three asbestos contractors when removing, repairing or encapsulating asbestos-containing material and where surface preparation is required. For larger roofs and structures, building owners will have to use registered asbestos contractors. In fact, for anything larger than 10m2, handling and disposing of asbestos, whether in a good state or not, can only be done by registered asbestos contractors, not just qualified ones. Geoffrey Jäck became MD of Indawo in 2013. He has worked his way through the company, starting on site and developing through the production department and sales and then management. 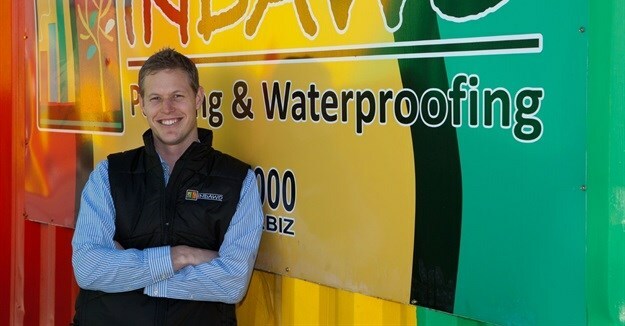 This gave him practical insight into how to run a remedial construction company and has equipped him with critical skills to be able to lead Indawo into an exciting future.